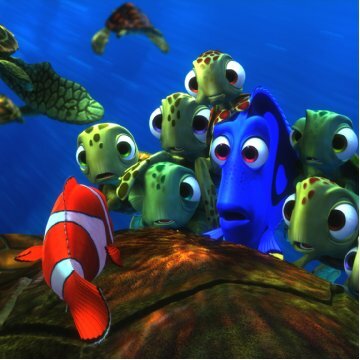 Taglines: There are 3.7 trillion fish in the ocean*, they're looking for one. 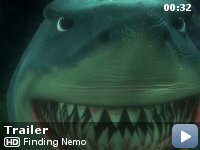 To see how realistic they could make it appear, the art team were asked to make exact copies of actual underwater and above water shots. Ultimately the results were simply deemed "too realistic" for a cartoon. Errors made by characters (possibly deliberate errors by the filmmakers): Crush the sea turtle claims he's 150 years old "and still young." Actually, at 150, Crush would be almost twice the normal lifespan of a sea turtle, which is about 80 years. Contrary to popular belief, not all kinds of turtles have lifespans of over 100 years. It is tortoises, which are land turtles, that are known for their very long lifespans and, even then, the current record is 188 years old, not much older (relatively speaking) than Crush. Yes, it's THAT good !! I'll be totally honest and confirm to you that everything what they say about this movie is true. It's a brilliantly animated masterpiece with lots of humor that actually works and a plot that really brings tears to your eyes from time to time. 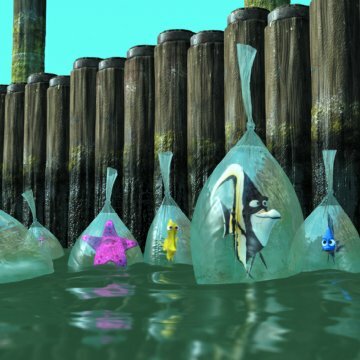 The modern artists of Pixar never cease to amaze the audience in expanding their horizons. 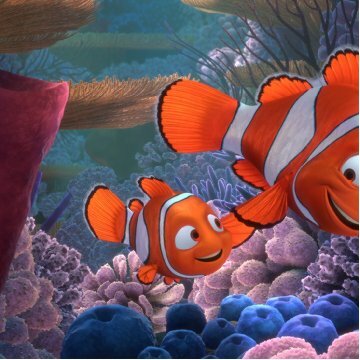 Finding Nemo is visually stunning and you can have nothing but respect for the people who created it. I was more or less skeptic about watching it, because it was so overhyped ! Two days before it got released in my country, the TV and press loudly announced that the DVD broke all records in the USA during its first release-day. 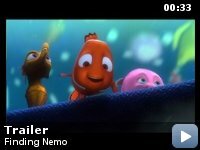 That's usually a sign of being typically mainstream and fake...but Finding Nemo is not. I'm allergic to fake sentiment and pathetic feel-good movies but I was really touched by this one. The moral and valuable life lessons are always present, but they're not shoved down your throat or thrown in your face all the time. This movie really relativates itself and that's important for a good comedy. And it's hilarious !!! 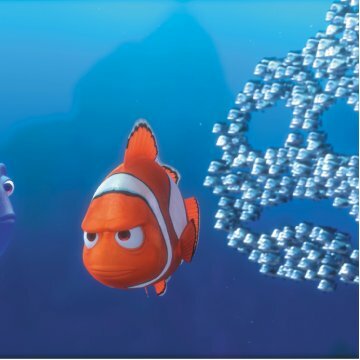 Every side character in Finding Nemo (and there are a LOT of them) is exceptional and worth a mention. 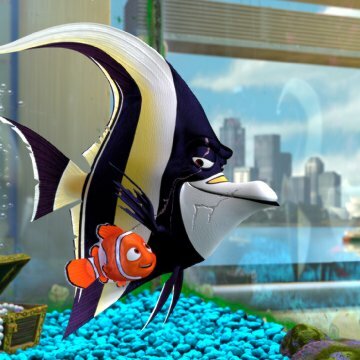 And the voices are cast perfectly as well...like the voice of Willem Dafoe for Gill, for example...a perfect choice. 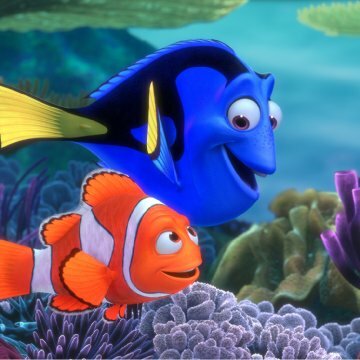 The character of Dory ( speaks through the voice of Ellen DeGeneres ) steals the show. She's an adorable blue fish who suffers from amnesia. She forgets what she's doing or going to every five minutes and that really leads to hilarious situations. Movies like this aren't just being made for children exclusive... They're good for everyone to realize you have to entertain yourself from time to time and just to enjoy the little things in life. I recommend this to everyone in the world. 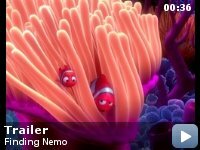 No matter if you're 9 or 99 years old, Finding Nemo will bring a smile on your face and leave behind a warm feeling in your heart.